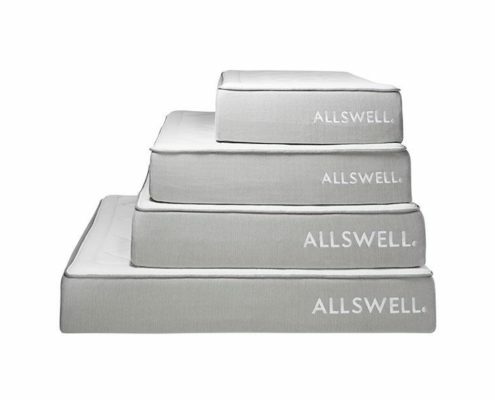 Allswell all foam is a 12″ memory foam mattress for a competitive price. See our findings below. 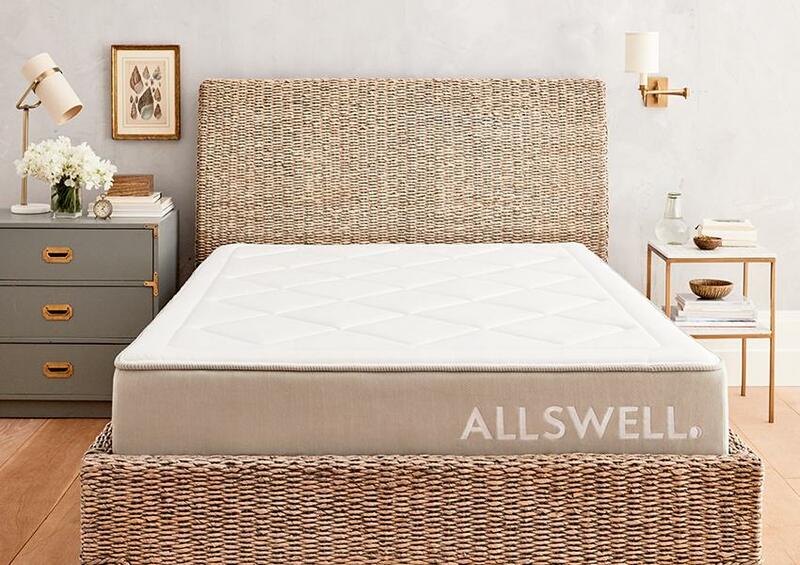 Allswell Home is another online mattress company that has experienced a recent boost in popularity thanks to the high quality of their products. 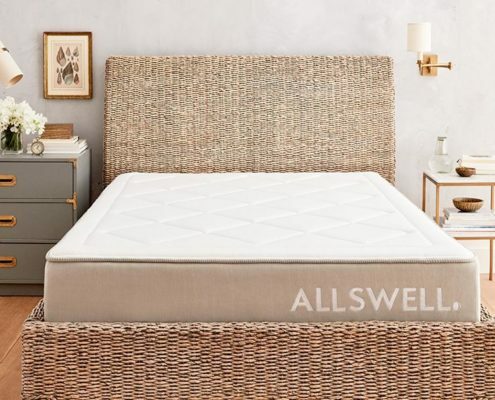 Currently their two main products are the Allswell Luxe Classic which is an all foam mattress and the Allswell Luxe Classic Firmer (which is a hybrid mattress that incorporates spring coils as well as memory foam). Today, we’re going to be discussing the Allswell Classic mattress, which is the softer of the two main options. When you buy an Allswell Home Classic mattress, you will be given two options for how you’d like it to be delivered. The first option involves the mattress being packaged and shipped to your front door for a fee of twenty-five dollars. Alternatively, you can opt to upgrade to the white glove delivery service option; this option costs ninety-nine dollars, and involve a specially trained delivery team not only bringing your mattress to you but setting it up for you as well. And for an additional fee of fifty dollars, this delivery team will take away your old mattress and dispose of it for you as well. Which option you choose is ultimately a decision you will have to make for yourself, but bear in mind that if you choose the first option, you will need to carry, maneuver, and unpack the mattress yourself; it comes in a box that weighs about seventy pounds, so unless you have a friend who can help you carry it inside to your bedroom, it might be a good idea to upgrade to the white glove delivery service so as to avoid straining yourself. On the other hand, if you are capable of handling the mattress on your own, you can save yourself some money by unpacking it and setting it up on your own. Whichever option you choose, do be aware that your newly delivered mattress will need some time to fully expand to its full size and shape before you use it, due to the way the mattress is compressed and wrapped in plastic for the shipping process. Want a memory foam mattress. This mattress is made entirely out of different types of memory foam, so it’s a great choice if you like the combination of support and comfort that this memory foam that provide you with. Want a mattress with minimal motion transference. Because it is made out of memory foam, which is great absorbing vibrations caused by movement, this mattress is a good choice if you want great motion isolation. You want a thicker mattress. This mattress is twelve inches thick and made entirely out of supportive and comfort-focused memory foam, so if you want a mattress that is thicker and more plush, this mattress is probably a good choice for you. Want or need firm edge support. Because this mattress is made entirely out of memory foam, it doesn’t have as good edge support as more traditional spring mattresses; therefore, if you really need or want a mattress with firm edges, this mattress likely won’t meet your needs. Do not like memory foam. Because this mattress is made out of memory foam, if you aren’t fond of memory foam (of if you want something that is firmer and more responsive) then this mattress is probably not the right choice for you. This mattress is available in three different firmness options: plush/soft, medium, and firm. That being said, because this mattress is made entirely out of latex, it is going to be more responsive and springy than other types of mattresses (such as ones made out of memory foam) regardless of the main firmness level. In any case, there are some notable differences between the three firmness levels, and you should consider your options carefully before selecting one type over the others. The plush option is softer than the other two firmness levels, with a top layer that most people say feels less dense by comparison. Generally speaking, this firmness level is best for side-sleepers, since the softer firmness will help you get the support you need without putting too much pressure on your hips, back, and joints. The medium option is the most popular of the three firmness choices, and is a great choice if you want a mattress that is not too soft, not too hard, and offers a great combination of both comfort and support. It’s also a good choice no matter what position you sleep in (on your back, on your stomach, or on your side) since it will contour to your body shape while still providing adequate support while you rest. The third and final option for the Metta Bed mattress is the one with a firm feel. This option is, by design, firmer than the medium and plush options with stronger support. This extra firmness makes it ideal for stomach sleepers, since it will help you maintain proper posture and spinal alignment when sleeping. It’s also a good choice if you weigh more and need a mattress that will support your weight comfortably. All in all, with three firmness options to choose from, it shouldn’t be too difficult to pick the right Metta Bed mattress for you individual sleep needs. The Allswell Home Classic mattress is also a great choice if you’re looking for a mattress that has minimal motion transference (the phenomena where movement on one area of the mattress causes vibrations and disturbs other parts of the mattress). Because this mattress is made entirely out of different types of memory foam (which is known for its ability to absorb vibrations and subsequently minimize motion transference), it’s an excellent choice if you want a strong emphasis on motion isolation. 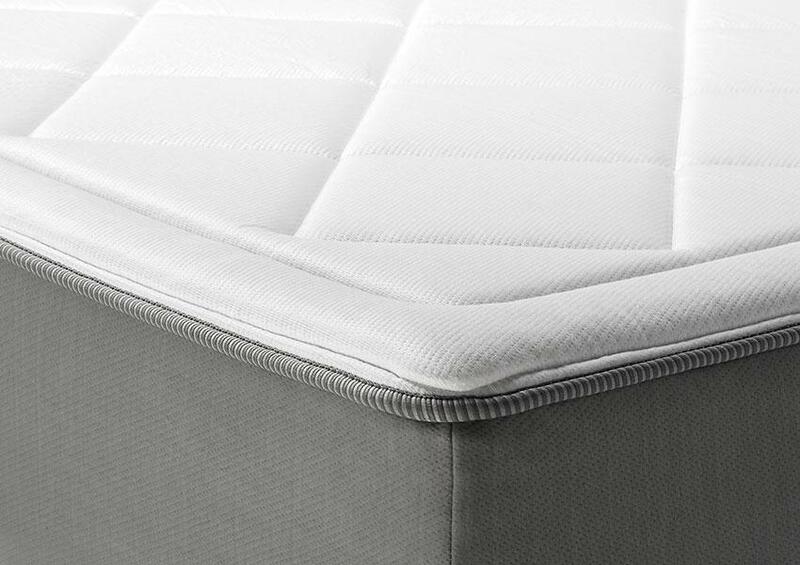 The top layers of memory foam on this mattress are great for absorbing vibrations caused by movement, while the denser base layer provides extra stability and is capable of absorbing any remaining vibrations that might result from larger movements and thus penetrate more deeply into the mattress. All in all, because this mattress is made entirely out of different varieties of high quality memory foam, you can count on it to be a reliable choice when it comes to reducing motion transference. Due to the compression and packing process that this mattress undergoes, there might be some off-gassing fumes when you first unpack it (this is primarily because your mattress will likely be shipped in from overseas, and as such will spend slightly longer than average compressed in plastic wrapping). That being said, because this mattress is made out of memory foams that are CertiPUR-US certified (meaning that they are made without ozone depleters, PBDE flame retardants, mercury, lead, heavy metals, formaldehyde, phthalates, and any other potentially harmful chemicals), any unpleasant fumes that you encounter when unwrapping it are going to mostly come from the plastic wrap rather than the mattress itself. In any case, your mattress will likely be fully aired out only a day or two after you first unpack it, so you don’t need to worry about the fumes lingering for a long period of time and disturbing your rest. Having a solid and supportive perimeter on your mattress is important not just for supporting your weight when you use those sections of the mattress but also for the overall durability and longevity of your mattress. If the edge of your mattress is too soft, or example, then your mattress will likely break down or become damaged and lose its overall shape more quickly than a mattress with firmer and more rigid edges. In the case of the Allswell Classic mattress, the edge support is pretty good, especially considering the fact that the mattress is constructed entirely out of memory foam, which tends to be less firm when it comes to edge support. That being said, it’s not advisable to sit on the edges of this mattress for extended periods of time, since it will break down the mattress in the long-term; brief periods of sitting are fine, but this mattress lacks the necessary support to bear your entire weight on the edges for long periods of time without causing problems. Therefore, if firm edge support is a necessity for you, this mattress might not be the right choice for you; however, if you only need a mattress with average edge support, this mattress will in likelihood work well for you. The Allswell Home Classic Memory Foam mattress is, in accordance with the name, made entirely out of memory foam. It is about twelve inches thick overall, and contains five layers total (each constructed out of a different type of foam). The first layer is an inch thick and made up of soft memory foam that is designed to provide comfort and pressure. The second layer is also comprised of a plush memory foam and is designed to help with body-contouring comfort, but is one and half inches thick instead. The third layer is a single inch thick and constructed out of Air Flow Foam, which is specially designed to make the mattress more breathable and better at dispersing and dissipating heat; it also had the additional benefit of helping with deep comfort. The fourth layer is made up of Super Soft Foam and is three inches thick. 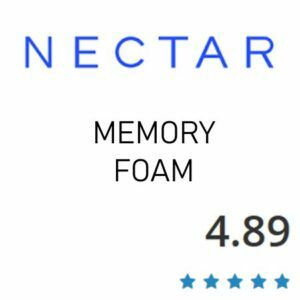 This variety of memory foam is incredibly soft and plush, and serves as a transition layer while also helping to provide additional deep comfort. The fifth and final layer of the Allswell Classic mattress is made up of five and half inches of high density base foam. This thicker layer serves as the foundation for the entire mattress and helps to provide support and stability. 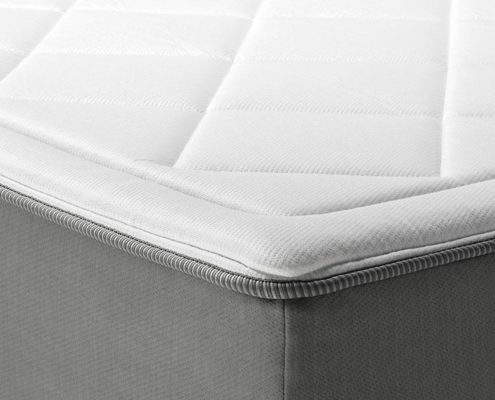 Ultimately, the success of this mattress is thanks to this unique combination of a dense and durable base layer with lighter and softer body-contouring layers above. This creates a well-balanced mattress that is able to provide you with both comfort and support while you sleep. Additionally, this mattress features a specially designed cover that is incredibly plush and also cool to the touch, helping to keep you comfortable while you rest. Another important quality worth mentioning is that all the varieties of memory foam utilized in the construction of the Allswell Home Classic Memory Foam mattress are CertiPUR-US certified (meaning that they are made without ozone depleters, PBDE flame retardants, mercury, lead, heavy metals, formaldehyde, phthalates, and any other potentially harmful chemicals). This mattress features a specially designed cover that is incredibly plush and also cool to the touch, helping to keep you comfortable while you rest. The Allswell will work great on any solid surface. The floor, platform slats, boxspring/foundation and they now offer an adjustable base as well. 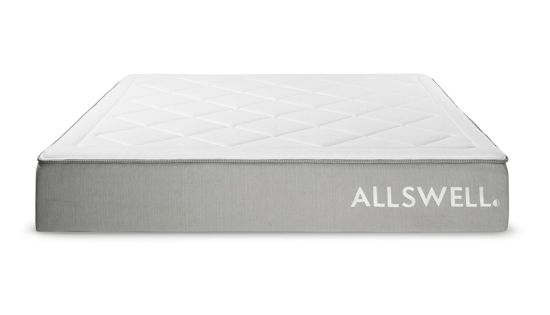 This mattress from Allswell is perhaps not the best choice if you want a mattress that stays entirely cool throughout the whole night. This is because this mattress is made out of multiple layers of memory foam, which is fairly notorious for its heat retention properties (meaning that heat tends to be absorbed and linger in the foam, rather than dissipating). That being said, some of these foam layers are specially designed to be better ventilated so as to allow for better aeration and air flow, which can help with temperature regulation and heat dissipation; this means that while this mattress might still retain some heat, it is better for temperature regulation than standard memory foam mattresses. Additionally, the Allswell Classic mattress also features a unique woven cover that is specially designed to feel cool to the touch. As a result, this particular mattress would be a good choice for anyone who doesn’t need to worry too much about overheating at night; on the other hand, if you tend to sleeper warmer at night, this might not be the perfect choice for your needs since this mattress does tend to retain a little more heat than you might be comfortable with. The Allswell being all foam will work great on an adjustable base. 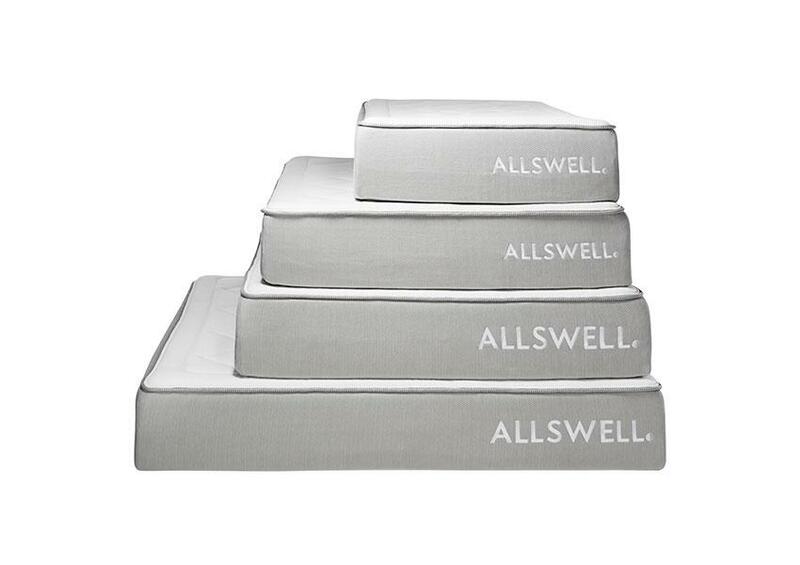 The Allswell Classic Mattress features a trial period of one hundred nights. This trial period of just over three months should allow you plenty of time to transition from using your previous mattress to using your Allswell mattress and also give you ample time to determine whether or not this mattress is the right choice for your individual sleep needs. And if you do end up deciding that this mattress doesn’t suit your needs for whatever reason, the returns process is pretty straightforward and easy. This mattress also comes with a limited warranty that covers it for ten years and will help in the event of any defects you discover (as well as any other serious issues you encounter that could compromise your use of the mattress). This warranty is fairly average in regards to mattress warranties, and is designed to cover the mattress for its entire lifespan. A warranty of this length shows that the company is willing to stand behind their product and help you have a satisfying experience with it. When deciding whether or not to try a new product, the opinions of other customers who have tried that product are an important part of the decision-making process. Therefore, in order to better help you determine whether or not the Allswell Home Classic mattress is a good choice for you, we’ve gathered together here some useful reviews from customers who have purchased it. We hope you find them helpful. “As a side sleeper, going from a traditional mattress to this wonderful combination of memory foam is one of the most transformative changes I’ve ever made to my sleep quality. I sleep like I’m on a perfectly supportive cloud nest, whether I’m on my side or my back. I don’t want to get out of bed in the morning but I have the energy to thanks to the quality of sleep I got the previous night. Thanks for making such an affordable, quality mattress that arrives with no nonsense and a little surprise!” – Ian. “This mattress is like sleeping on a cloud! Incredibly soft, yet not too soft where you completely sink in. It has the right amount of firmness to support those with back issues. The overall quality of the bed is absolutely amazing and the materials feel very luxurious. It arrived very quickly and was extremely easy to unfold, as it took less than 5 minutes for it to fully expand. 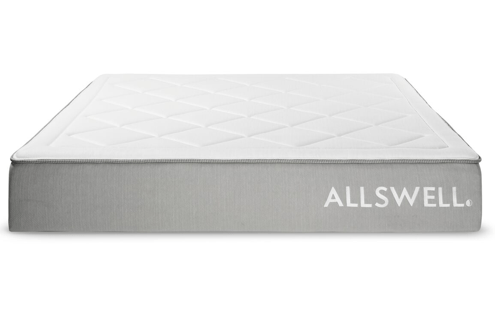 Can’t rave enough about this mattress and loved the added eye mask within the packaging!” -M.
“BEST. MATTRESS. EVER. Absolutely divine for side-sleepers like me.Once I tried it, I couldn’t go back to the one I have at home. Two very enthusiastic thumbs up!” -Thomas. “I’m usually a firmer bed person, but this feels so supportive and comfortable. It’s got really nice memory foam that doesn’t sink in too much but feels really supportive while laying down.” -Katie. 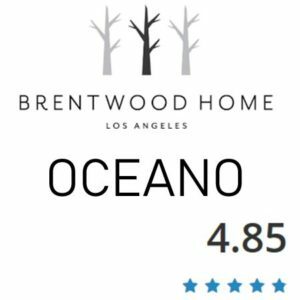 “The quality and feel of this mattress makes this price point an absolutely steal. The memory foam is just right and contours to my body. This would be a great bed for people used to sleeping on their sides.” – Ed. 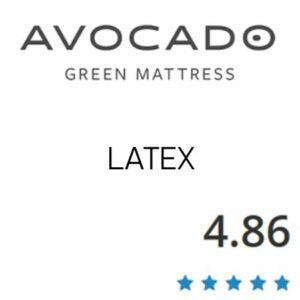 Overall, this mattress is a great choice if you want something reasonably priced that also provides high levels of comfort as well support and pressure relief. It’s also great if you want something that is made with only the best materials (with no harsh or harmful chemicals contained within them) and comes with a ten year warranty that will cover you in the event of any defects or problems you encounter while using the mattress.